It doesn’t get any cooler than this! 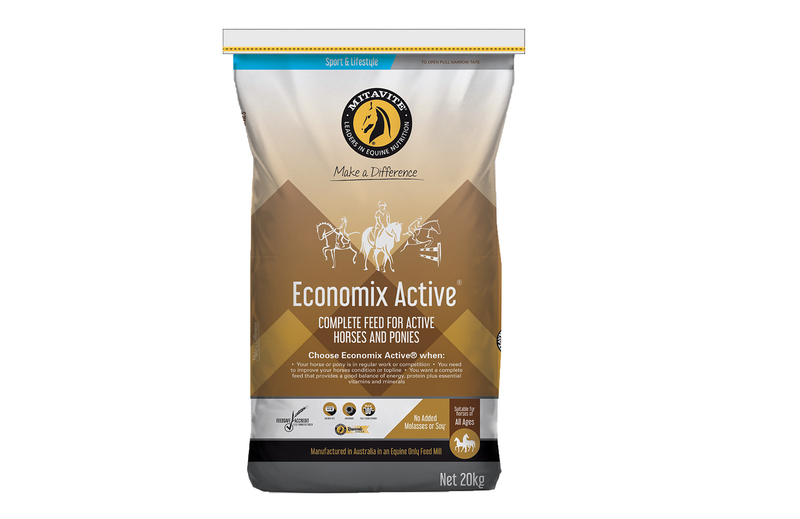 Mitavite® Xtra-Cool® is the ideal choice for horses and ponies in light to medium work and for those that can’t tolerate, or don’t require high energy feeds. 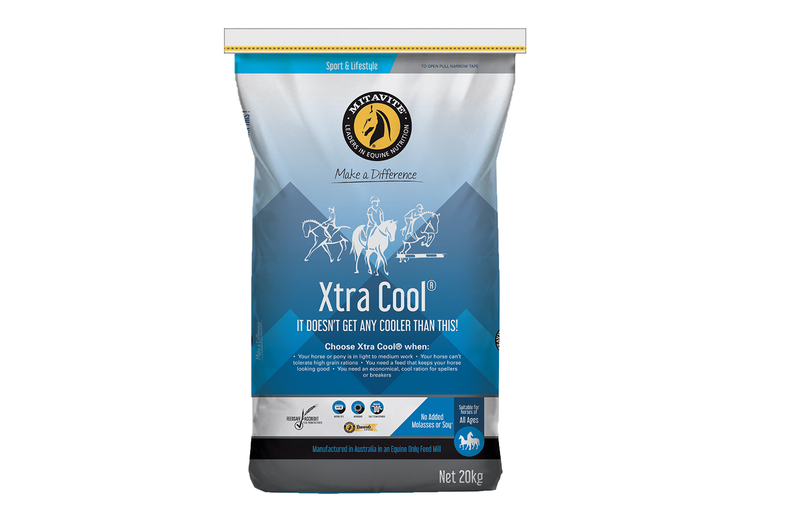 Xtra-Cool® contains a balanced formulation of vitamins, minerals, electrolytes, oils and extra Magnesium so you can be sure you are providing your horse or pony with the best in nutritional support without that heating effect. Complete with vitamins, minerals and electrolytes. Highly palatable & fully steam extruded. Extra Magnesium for that calming effect. Complete feed for active horses and ponies. Super food for sport horses! 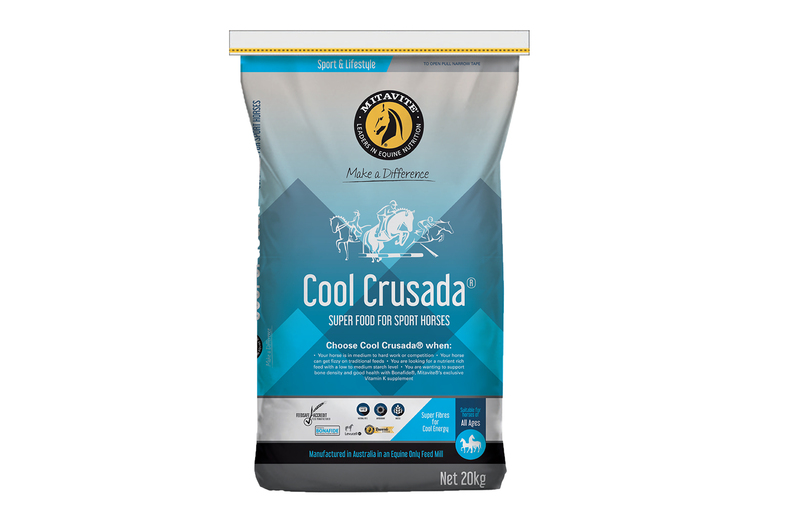 Cool Crusada® is one of the most innovative feeds on the market, raising the bar in the delivery of premium nutrition for sport horses and ponies across all performance disciplines. Cool Crusada® delivers across all measurables and provides additional support for horses’ critical systems. Energy is supplied by ingredients that are metabolized via three separate pathways, providing a combination of fast acting, medium and slow release energy sources. Super Fibers are included to provide support for hind gut function whilst supplying a cool energy source. 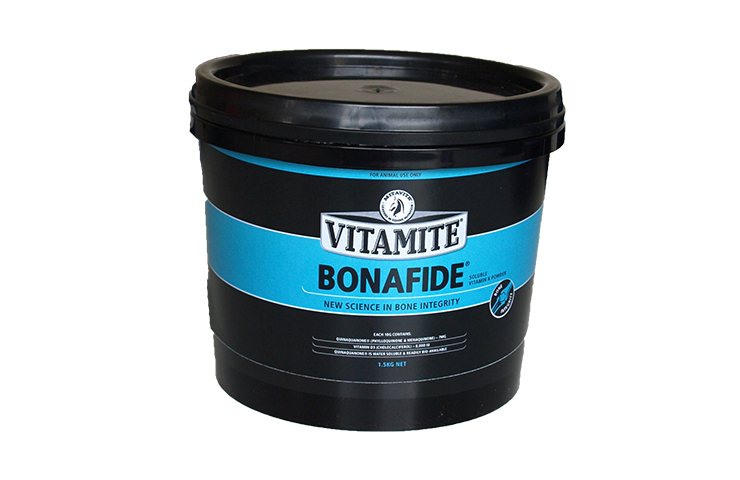 Mitavite®’s revolutionary supplement Bonafide® is included to support bone and cartilage integrity and assist in maintaining soundness during peak performance. For medium, hard working and competition horses. Highly palatable muesli style complete feed. Contains Levucell® SC Live Yeast to aid in the improvement of feed digestion and minimize the risk of digestive upsets. Added Super Fibres for cool energy and condition. Cool low starch muesli - without the fizz! 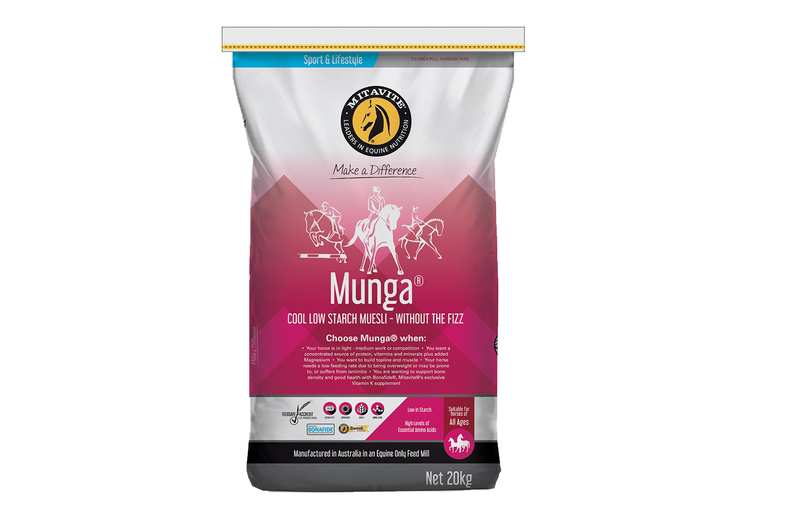 Mitavite® Munga® is a cool low-starch muesli feed with no added grains. Suitable for horses and ponies in light to medium work. Mitavite® Munga®'s concentrated formulation is economical, palatable, low in starch and gluten free. It provides optimal levels of high quality, easily digested protein, Essential Amino Acids, vitamins, minerals and electrolytes. It is ideal for all horses needing more top line and muscle for sport, show and performance or horses that can't tolerate high grain rations. It is an ideal choice for horses and ponies that are good doers that can easily become overweight or are prone to laminitis. If more energy is needed, Mitavite® Kettle Roasted and Rolled Grains or Vitamite® Performa 3® oil can be added to the ration. Low starch level of 5.2% and no added grains. 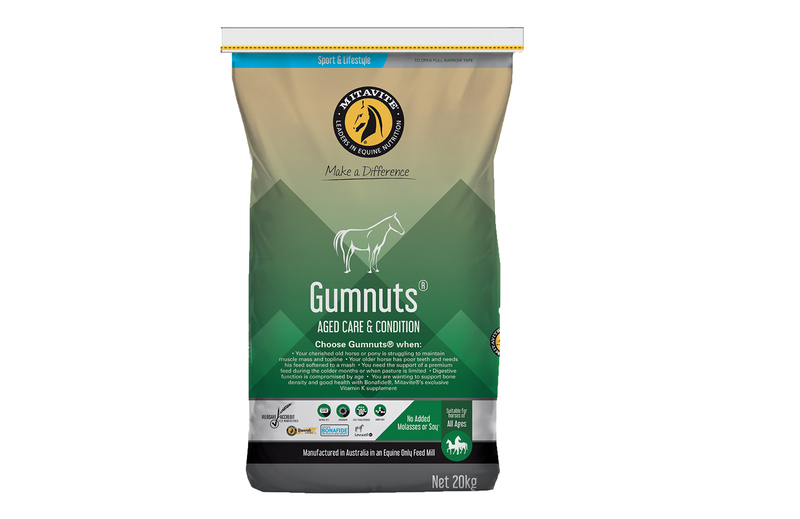 Mitavite® Gumnuts® is Australia’s original and most trusted feed specifically formulated for aged horses and ponies. Gumnuts® is highly nutritious, palatable and provides a unique balance of vitamins and minerals formulated to address the challenges of old age. Along with Omega 3 oils, antioxidants and Essential Amino Acids which are provided in a highly digestible form. Gumnuts® reduces to a soft mash when water is added. Fully steam extruded to maximise digestibility and nutrient utilization. Nutrient dense to provide optimal nutrition for older horses and ponies. Can be wetted down easily to a mash for beloved oldies with poor teeth. Contains Levucell® SC Live Yeast aids in the improvement of feed digestion. 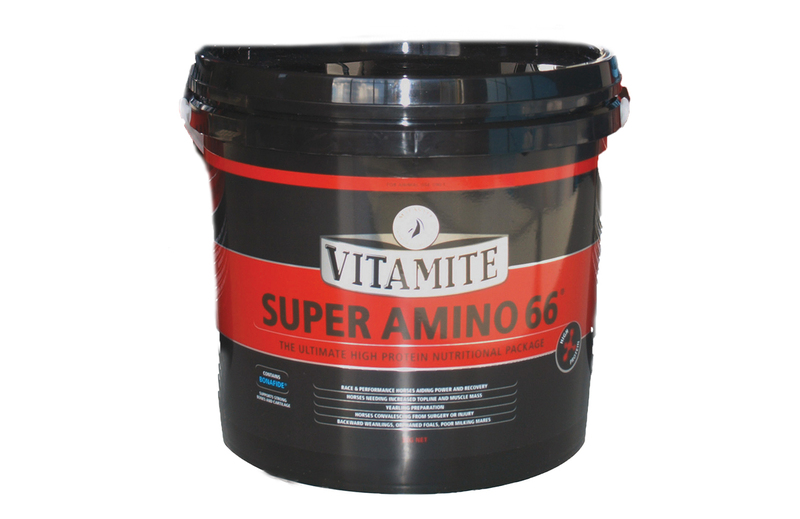 Super premium nutrition for young stock, broodmares & spelling horses. 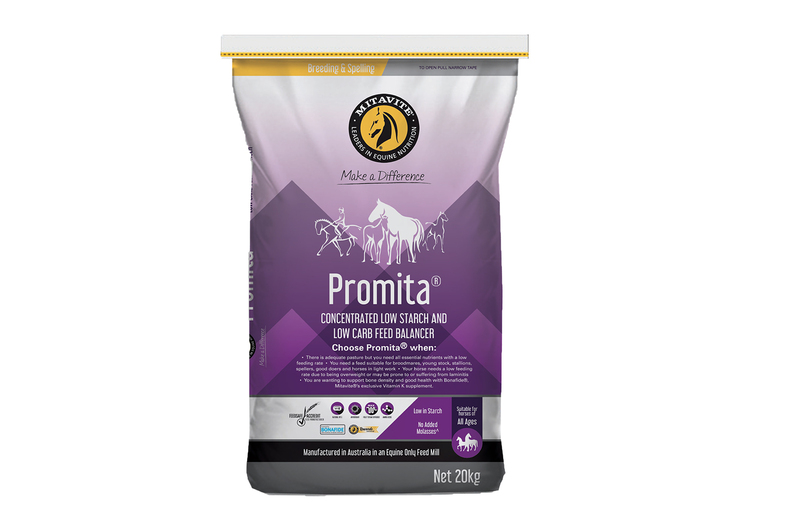 Mitavite® Breeda® is one of the most trusted and popular complete feeds available. Supporting the development and replenishment of body tissues during critical growth phases such as in a mares final 3 month of pregnancy. 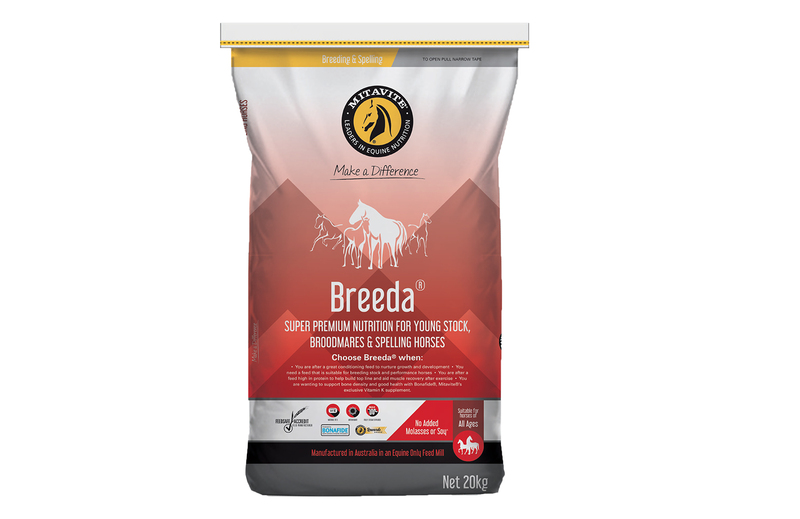 Breeda® has been scientifically formulated to promote optimal, balanced growth and to overcome the problems associated with raising young horses on less than perfect pasture. Critical to the success of Breeda® is the Essential Amino Acid profile and the positive impact that this has on the development of lean muscle, strong tendons and smooth flat bone. This, coupled with the delivery of highly digestible energy, vitamins and minerals in a steam extruded, palatable nugget, assists in limiting peaks in blood sugars often associated with bone developmental problems. You are wanting to support bone density and good health with Bonafide®, Mitavite’s exclusive vitamin K supplement. Fully steam extruded for maximum digestibility. Great for all breeding and growing horses. Formulated to support the development and replenishment of all body tissues. Extra energy and condition during all sport and leisure training. Concentrated low starch and low carb feed balancer. 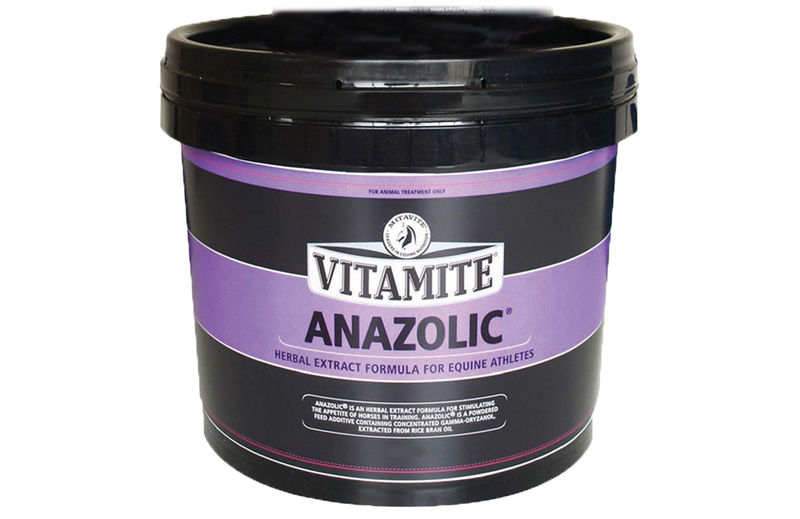 Anazolic® is a proven appetite stimulant, excellent for horses lacking condition, muscle, top line and also helps minimise fatigue. For restoration of natural sweating and breathing in puffs & dry-coat horses. 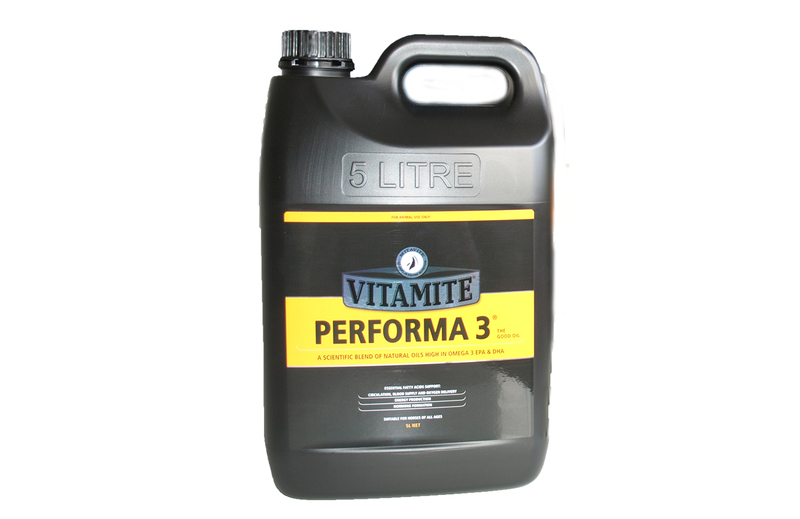 Vitamite® are taking a nutritional approach to managing horses who suffer from Anhidrosis, or non-sweating. When a horse doesn't sweat, this can affect optimum performance in the equine athlete and limit their ability. The implications of this condition can be very detrimental to your horses’ health. Sweat-Up® is a scientific formulation of electrolytes, minerals and Omega 3 Fatty Acids, with added Maritime Pine Bark extract. This combination includes a natural anti-oxidant which enhances oxygen exchange and a strong Zinc supplement to support the lung exchange process, amongst others. For all of those living in the tropics, Anhydrosis in horses is a serious issue and you need to know how to manage your horses in particular during these hot and humid months. Don't ignore the warnings. Inability to sweat, high respiration (even when at rest) dry dull coat, these are all warning signs. 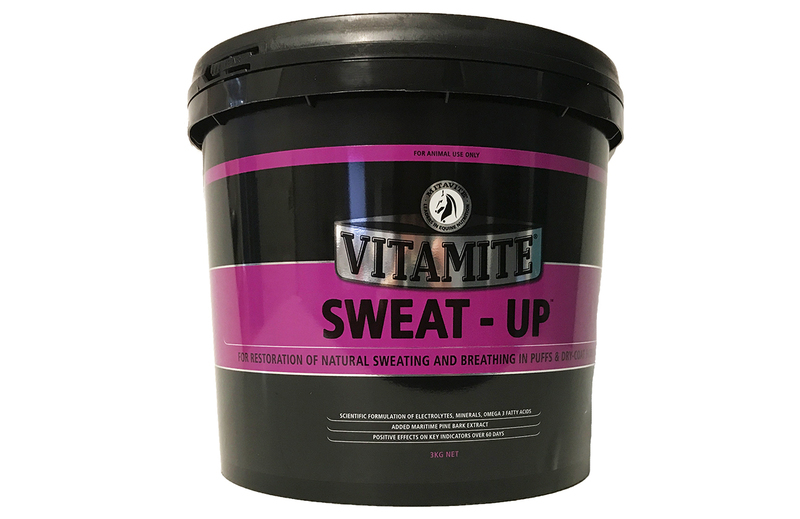 Vitamite® Sweat Up®, its scientifically formulated to assist horses with this serious condition. Positive effects on key indicators over 60 days. An aid in the prevention and treatment of hoof disorders. 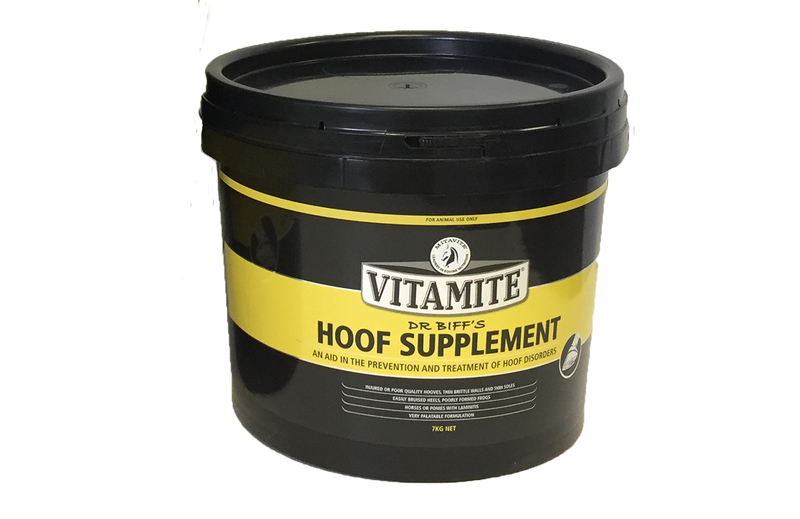 Vitamite® Dr Biffs® Hoof Supplement is an aid in the prevention and treatment of hoof disorders such as injured or poor-quality hooves, thin brittle walls, thin soles, easily bruised heels, poorly formed frogs or laminitis. Injured or poor-quality hooves, thin brittle walls and thin soles. Easily bruised heels, poorly formed frogs. Horses or ponies with laminitis. The supplement provides all nutrients required to accelerate keratin production. Whilst keratin production happens naturally in response to injury or insult, it can only occur if all nutrients required are available and consumed daily. It has dramatic effects on the rate of hoof repair and regeneration and unlike many Methionine - containing supplements which deter feeding, this supplement is very palatable. It is also non-siftable which defeats the horse’s ability to leave a portion of powder in the feed. Biotin – well recognised as a rate-limiting nutrient for hoof growth and hoof quality. Methionine – and Cysteine which can be synthesised from it, are the sulphur containing amino acids which are required more by keratin than any other tissue, often deficient when accelerated growth is required. Zinc – if supply is marginal, tissue with abnormal demand is the first to suffer. Vitamin E – essential to additional keratin production. Vitamin A – one of the carotenoids essential to all keratinized tissues, needed mostly by horses not on high quality fresh pasture. Omega-3 – all membranes, including hoof wall microtubules, and laminae, must have omega-3 to be built with suppleness and strength. Omega 3 EPA & DHA Oil - Cool energy source as well as supporting general health & wellbeing. A rich, natural source of Omega 3, 6 & 9 Fatty acids. Helping keep the balance right for your horse by combining Omega 3 rich vegetable and fish oils with added garlic to help aid immunity. All performance disciplines may benefit with lowered heart rates, lower packed cell volumes and enhanced red blood cell formation, suppleness and flexibility as well as improved red blood cell strength – all vital for peak performance. Lung health may be improved due to decreased inflammation and improved blood circulation. Breeding stock may benefit with enhanced fertility and improved sperm motility when the sperm has been frozen or chilled. Horses with cartilage degradation and inflammation may see an improvement in symptoms and all horses may benefit from improved joint maintenance. Performa 3® Oil is a cool energy source as well as supporting general health and wellbeing. Research in human and animal nutritional have provided many advantages for feeding Omega 3 rich oils, particularly DHA and EPA. Omega 6 oils have a pro-inflammatory effect on joints, skin and hooves. By moving the balance of power to the Omega 3 oils inflammatory responses are reduced. Research on horses supplemented with fish oil found the horses had lower heart rates and lower packed cells volumes during exercise. This can have a favorable impact on the time to fatigue. Omega 3 supplementation enhances red blood cell formation, suppleness and flexibility. There is an improvement in blood vessel strength, elasticity of connective tissue and membrane flexibility with Omega 3 supplementation. Lung health improves due to decreased inflammation and improved blood circulation. This can be beneficial for horses with exercise induced pulmonary hemorrhaging. Omega 3 supplementation increases insulin sensitivity. This increases the uptake and storage of glucose and ultimately the energy available to the horse. Bone and lipid metabolism is improved when Omega 3 fatty acids are used. Cartilage degradation and the pain and inflammation associated with degenerative joint disease such as arthritis is reduced with Omega 3 supplementation. Anxiety and anti-stress responses are reduced with fish oil supplementation, including improvement in nervous system structure and function. 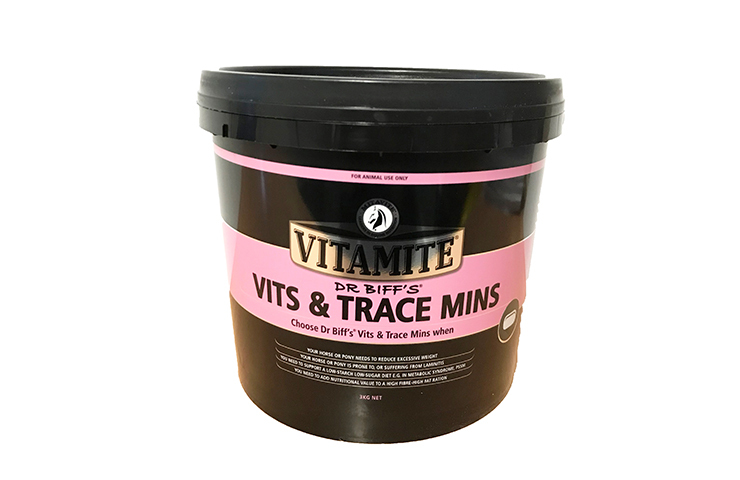 Dr Biff’s Vitamin and Trace Mins provides a balanced source of essential nutrients when only hay or dry pasture is able to be fed. Suitable for horses that cannot have access to good quality pasture or who are unable to tolerate dietary starch or sugars. Important: Ensure sufficient fibre is fed in the form of pasture, hay, chaff or Speedi-Beet®. The nutritional first aid kit every stable should have. The ultimate high protein nutritional package, targeting muscle and bone growth. Orphan & backward foals, lagging weanlings & yearlings plus poor milking mares. The New Science in Bone Integrity. Vitamin K is important for bone density and soundness in performance horses. The active ingredient in Bonafide® is Quinaquanone, a water soluble, bio-available form of Vitamin K1 & K2. Vitamin K1 & K2 has a critical effect on the function of osteocalcin, the bone protein that binds the mineral and protein in bone together. Without sufficient Vitamin K the binding process is incomplete and low density or defective bone and cartilage are produced. Vitamin K1 & K2 are naturally available in fresh, growing green pasture but it is highly unstable, being degraded by UV light, wilting or “wintering off”. There is an established correlation between bone density and the incidence of OCDs and DODs in yearlings and DMD (shinsoreness) in 2-year olds. Bonafide® is the first product to contain Quinaquanone, a bioavailable form of Vitamin K1 and K2.